Our first significant snow was perfect for making snowmen! 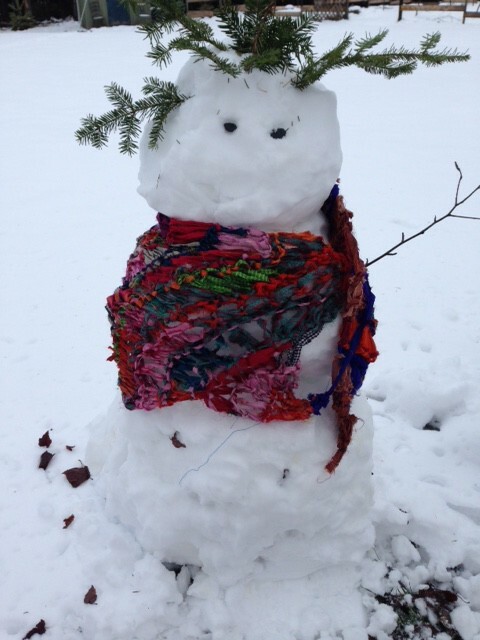 Sisters Know Best is getting in the spirit of the winter season by creating snowmen for both night and day this year! Share your snowmen pictures with us! We’d love to see your winter spirit! A friend had asked me to share a picture of a silk sari scarf I had just finished knitting. 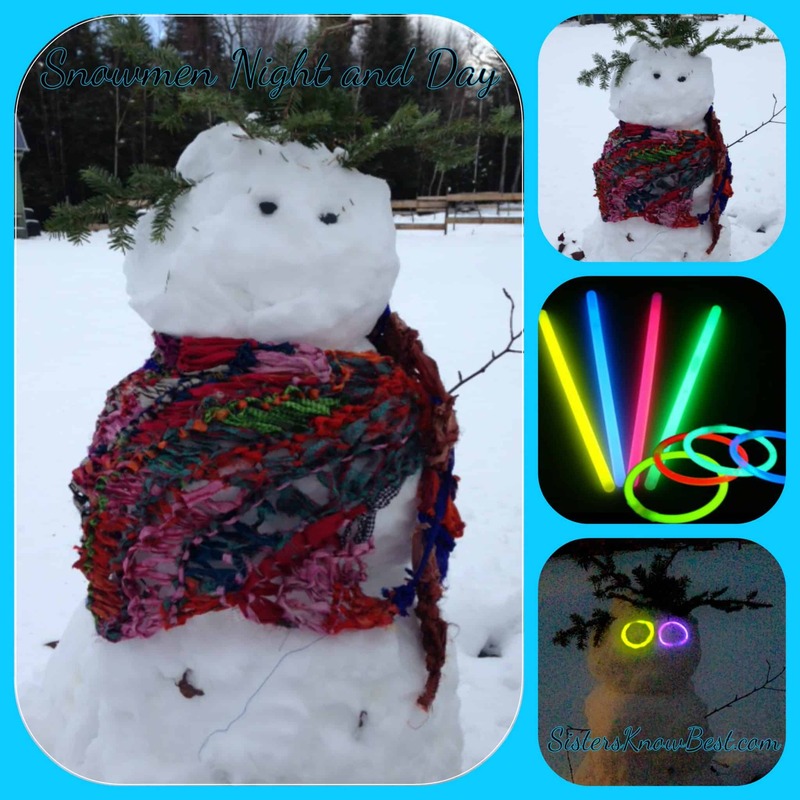 I thought my snowman – er, snowwoman would be the perfect model! Her snowy white skin was the perfect background for my brilliant-colored sari scarf. I donned her with boughs to form a sort of crown for her head and cloaked her with the sari scarf. My friend got a kick out of it and I thought you might too. 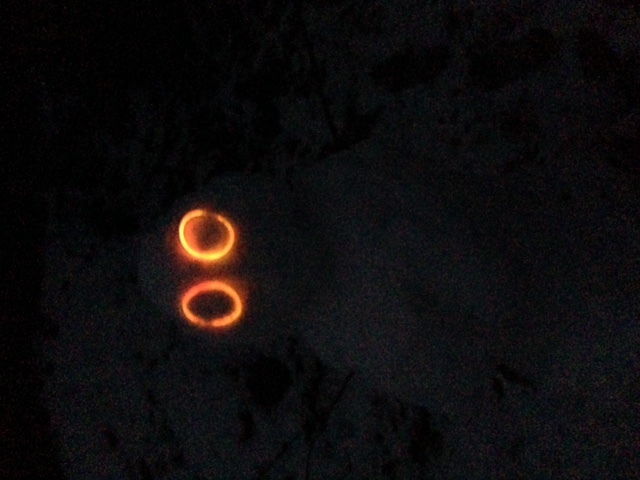 Later in the day, I found a couple glow sticks and made her eyes light up. My guys loved it when they came home. 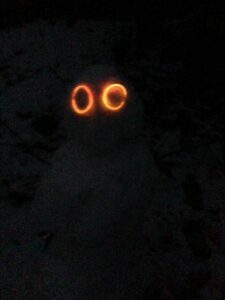 They laughed as they pulled in the driveway and saw these two orange eyes shining out from the middle of nowhere. Perhaps they felt they’d left me alone too long and I’d gone a bit daft. No matter. 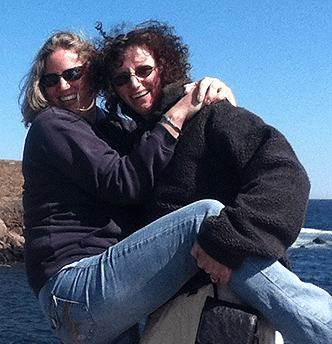 It was a fun day – and night! The forecast says 40 degrees today. My snowpeople will have short lives, but they were a lot of fun to make! Every now and then we need to just let our inner child go wild and add a little color to our all white canvases. During the first snow fall, what does your inner child call out to do? Snowmen? Snow angels? Sliding? Hot Chocolate? Doesn’t really matter what you do, as long as you’re smiling!